HAVE YOU HELPED TO PRESERVE AND GROW THIS RESOURCE? Welcome to www.amanitaceae.org. Our goal is a monographic level treatment of the Amanitaceae with facts and data accessible to persons of multiple levels of interest and expertise. See Site News to learn of recent changes to the site. If you use data or quote text from this site in any medium, please, use the "cite this page" feature (on every page in the blue bar at the top) and cite your source. Compare spore data using the User Sporograph page. Site preferences can be set here. This site provides data on taxa of the macrofungal, largely ectomycorrhizal genus Amanita, the amycorrhizal genera Limacella and Catatrama, and the family Amanitaceae (Agaricales, Basidiomycetes, Fungi) of which these genera are the only known members. Text is supplemented by monotone or color illustrations of the fungi wherever possible. This is likely always to be a work in progress. Note: The site is recommended to be viewed via Mozilla Firefox with the browser window dimensions maximized (press the F11 key in Firefox). Firefox can be downloaded without charge. OUR THANKS: We greatly appreciate permission granted to include on the pages of this site line illustrations of C. Bas and watercolors of J. E. B Corner that originally appeared in the journal Persoonia. We are pleased to be honored with a collaborative and mutually beneficial relationship with MycoBank that has improved the quality of this site in matters nomenclatural. We are very grateful for the honor of having had material from this site used in the original sample pages (May, 2007) of the Encyclopedia of Life. Tulloss is very grateful for the opportunities of working with the Great Smoky Mountains ATBI and with the Fungus Taxonomic Working Group del Instituto Nacional de Biodiversidad de Costa Rica. We wish to offer special, and (in the case of RET) personal, thanks to David C. Tulloss (heart and brain of tullabs.com) who proposed the major rebuilding of the Amanita Studies site and conceived, designed, accumulated, and executed the database and all the software that makes this site possible. NOTICE: This site is not associated in any way with sites selling wild mushrooms in any form, the extracts of such mushrooms, or any related paraphernalia. Such sites have made unauthorized use of our pages to create an apparent relation to scientific research; however, the visitor to those sites should be suspicious of out-of-date pages with altered design or altered background colors. 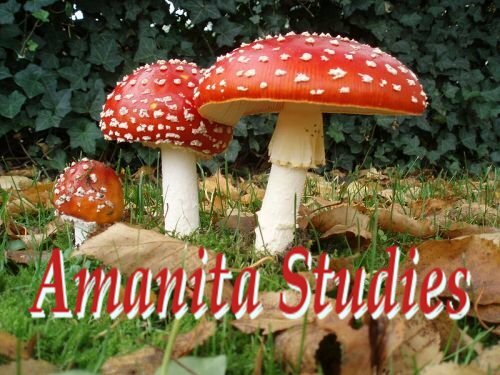 Pages stolen from this site or its predecessor site and bearing an editor's name or even a contributor's copyright notice are not authorized by the Amanitaceae Studies site's editors in any way. 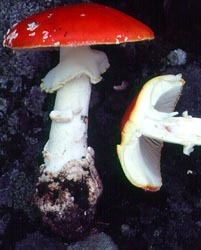 We do not promote or encourage experimentation with ingestion of toxic Amanita species.